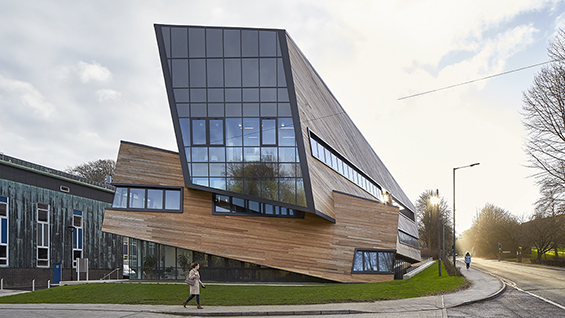 Studio Libeskind, Ogden Center for Fundamental Physics at Durham University, Durham, United Kingdom, 2016. Image Courtesy of Hufton+Crow. An international figure in architecture and urban design, the architect Daniel Libeskind is renowned for his ability to evoke cultural memory in buildings of equilibrium-defying contemporaneity. Informed by a deep commitment to music, philosophy, and literature, Mr. Libeskind aims to create architecture that is resonant, original, and sustainable. Born in Lód'z, Poland, in 1946, Mr. Libeskind immigrated to the United States as a teenager and, with his family, settled in the Bronx. After studying music in New York and Israel on an American-Israel Cultural Foundation Scholarship, he developed into a musical virtuoso, before eventually leaving music to study architecture. He received his professional degree in architecture from the Cooper Union for the Advancement of Science and Art in 1970 and a postgraduate degree in the history and theory of architecture from the School of Comparative Studies at Essex University in England in 1972. Daniel Libeskind established his architectural studio in Berlin, Germany, in 1989 after winning the competition to build the Jewish Museum in Berlin. In February 2003, Studio Libeskind moved its headquarters from Berlin to New York City when Daniel Libeskind was selected as the master planner for the World Trade Center redevelopment. Daniel Libeskind's practice is involved in designing and realizing a diverse array of urban, cultural and commercial projects internationally. The Studio has completed buildings that range from museums and concert halls to convention centers, university buildings, hotels, shopping centers and residential towers. As Principal Design Architect for Studio Libeskind, Mr. Libeskind speaks widely on the art of architecture in universities and professional summits. His architecture and ideas have been the subject of many articles and exhibitions, influencing the field of architecture and the development of cities and culture. Mr. Libeskind lives in New York with his wife and business partner, Nina Libeskind. In addition to the New York headquarters, Studio Libeskind has an European partner office based in Zürich, Switzerland. This event is free and open to the public. Reserve a space here. Please note first come, first seated; an RSVP does not guarantee admission as we generally overbook to ensure a full house. All registered seats are released 15 minutes before start time, so we recommend that you arrive early.